Anna thought: there was a time when people would stop what they were doing, even if they were only walking, and watch, serious and upright, as a cortège went by. Perhaps in other places they still did it. A respect for the dead. Here a funeral car was just part of the traffic, just one of too many purposes choking a road, and a particularly inconvenient one at that. Going too slowly, taking up too much width, the attempts of the mourners in their following cars to keep in line being at variance with city drivers’ opportunistic overtaking. And the passers-by turning from the embarrassment of death, pre-empting the intrusion of such an uncompromising phenomenon, or peeking, surreptitious voyeurs, to see how the participants in the procession were reacting. Were there tears? Handkerchiefs pressed to mouths? Women collapsing on grim-faced men? Formal solemnity? Boredom? Anna had done it herself. Had driven past undertakers while the professionals loaded up the hearse; had seen them lounge outside churches while the service was on; had observed how cheap their black coats invariably looked; had noted the style of the flowers. And now all was being done to her, as they were conveyed after the coffin which contained her mother. James was at her side, holding her hand, at the ready in case she should be in need. Daniel there, her brother. In charge of the proceedings. Jocelyne immaculate. And Anna herself, sitting by the window, what was she? ‘Where you going, Mummy?’ asked Louis, while Mrs Sausby hovered. ‘You don’t get better when you’re dead,’ said Ella. ‘She’s in Heaven,’ said Mrs Sausby. ‘We’re going to the park,’ said Mrs Sausby. When her father died, Anna had no children. She had no James. Daniel had organized that funeral too, while she stayed with her mother, wrote the letters and opened the door for those who had come to offer sympathy. She could hardly remember the ceremony. It had happened and her mother had been dignified. Afterwards a man came to read the meter. He said, ‘Cheer up, love. It might never happen.’ They’d smiled and disguised the situation so as not to embarrass him. It had embarrassed most of Anna’s friends then too. They were young and hadn’t known what to say to her, so said nothing and looked at her obliquely. For a time, Anna felt that she had left their path through life to travel down some more testing track through more concentrated atmospheres. It was a track which looped round and took her back towards their path, running for a time parallel to it, so that she was near to the others but not part of them. She remembered how fragile they seemed, how each was merely a moving reflection in glass which might at any time shatter and fall down in shards, leaving no person. Then her track became one again with the main pathway of solid, durable people, and although she could remember these images she no longer saw them. That had happened, she supposed, because she was younger and her father, her first real death, had died unexpectedly. Yet the lack of ambivalence in the situation meant that a resolution was possible. He was her father: she was his daughter. He had died in that relationship to her. They both knew where they were and Anna had known what loss she had to come to terms with. Not so this time. Her mother was not religious. The church service starting now was for Daniel’s benefit, although her mother would not have objected. Life has its traditions, she would say, and the church was sometimes party to these, lending anchoring points in the flow of time. Christmas, of course, and Easter to a lesser extent, baptisms, weddings and funerals. Sometimes harvest festivals too – a harkening back to her childhood on her own grandparents’ farm. Anna knew the farm well enough although she had never visited it. Her mother had rarely played with them as children but she had talked. She talked of the farm, the farmhouse, the animals. She talked of going away to school and coming back in the holidays. She declared that no child of hers would ever be sent away to school. She talked of the pear tree, the apple loft, the old scythe hanging in the barn; haymaking and how to float earwigs out of your ear with castor oil; the dangers of drinking too much cold water quickly on a hot day. This funeral service was full of agricultural references. It was fitting. What adventures had there been in suburban life, running a house and a husband, bringing up children? She was busy in local events, the school fetes, fund-raising for charity, visiting the elderly, managing them. She’d arranged Anna’s wedding – large, white, traditional – the way she knew her husband would have wanted it, and had a good go too at organizing Daniel’s but Jocelyne was having none of that and lined up with her own mother to whom Anna’s could not but acknowledge precedence in the matter. She made sure that Anna’s children were baptized and gave unsolicited and ignored advice to Jocelyne about not leaving maternity too late. Only a short time ago, visiting an ancient protégé in a nursing home, she had decided not to wait for the attendant to support her frail friend into the tearoom, but had hoisted her up and done it herself, and was miffed by the attendant’s displeasure and comments about two sets of broken hips. And now they were heading for the crematorium, following her directive. The most practical way of dealing with a body, and the flower money to go to the fund for Macmillan nurses. The requirements had been stated, but what had she felt? What had it meant to her to be ageing, to be ill? When the curtains closed, was it the end? Had she hoped that somehow there might be more of something? So brave, the visitors said, so strong, so unselfish. Had Daniel resented it too? He never showed it but progressed steadily with increasing gravitas and impenetrableness which made it impossible to discuss such things with him. Mr Forster’s tax was done, at a time which suited Daniel. Now back at his house, with discreet caterers providing refreshments for the mourners, Daniel spoke quietly and courteously, moving from one to another, whilst Anna nodded and mouthed platitudes and saw that James kept glancing over to wherever she was. She hadn’t wanted it to be this way. There should have been time before this death. Everyone was right: her mother had been good, kind, caring, courageous. She had been lively and involved. She had not weighted them with her fears. Anna wanted to be able to think so too. No, more than that. She could think so: she wanted to be able to feel so. It had needed a new relationship, redressing the balance. She shouldn’t have continued to be manipulated and subsumed. She should by now have broken away, detaching as well the resentment which tied her to her guilt about this rancour. She should have been able to work through this before, to offer the death a pure response, unalloyed by messy, baser complexities. She should have been able to grieve. It could have been a comfortable death. It could have been resolved. Her mother had seemed prepared for death. Why hadn’t Anna been allowed to be ready too? To be separate, grown up, showing care and consideration for the sick woman, making loving decisions. Her mother had died too soon and denied Anna the comfort of grief. She sank into the seat of the car, going home. ‘How are you?’ asked James. The children ran to greet them as they entered the house. Anna went with them into the kitchen as Mrs Sausby said goodbye and demurred with James in the hall over her payment. ‘You were sad, Mummy,’ said Ella, putting her hand in Anna’s. ‘Why?’ said Louis. ‘I’m sad, and I’m not sad,’ she said, and she scooped them up, one in each arm, though they were heavy for that now, and whirled them round rhythmically, singing, as they stretched their heads back laughing, till the tears ran. Shall We Dance? 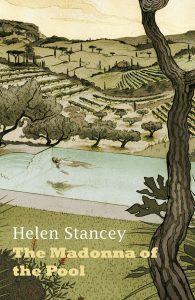 is a short relationship story from Helen Stancey’s recently published The Madonna of the Pool. Richly poetic, deeply moving and utterly engaging, the collection explores everyday life with its’ triumphs and compromises, demonstrating Helen’s exquisite understanding of the subtle intricacies of human adaptation, endurance and optimism. To buy the full collection of short stories visit Blackwell’s or Amazon.